In Windows 7, if you ever have a file open in Windows Explorer that you know you’ll want to manipulate in another application, such as attaching the file to an email (or embedding an image in a blog post! 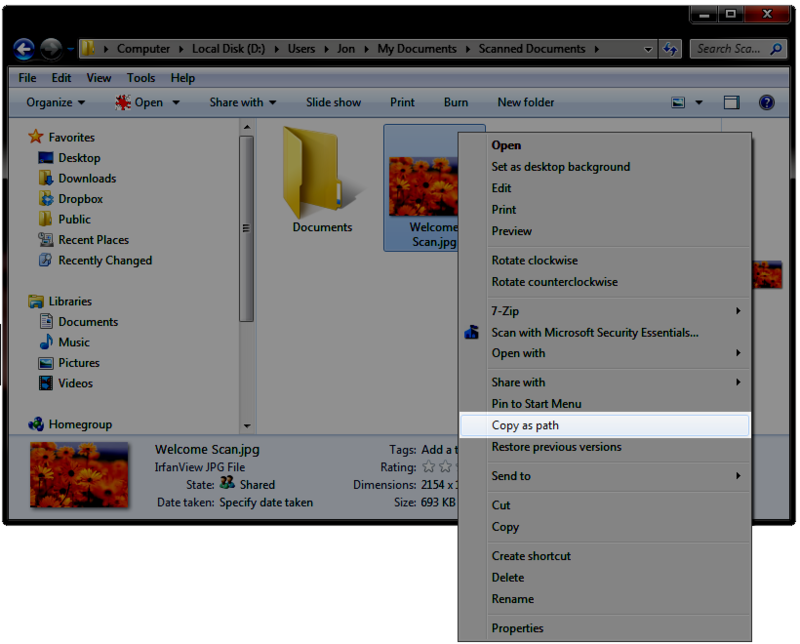 ), a quick way to copy the file’s fully-specified path and filename to the clipboard is to hold Shift and right-click the file, and select the Copy As Path option. Then, you can just press Ctrl+V to paste the path into the Open File… dialog of the target application! No need to drill down through your filesystem’s folder structure to find the file. It’s nice that this is included as native functionality in Windows 7. In Windows XP, it was necessary to use a 3rd-party utility such as ClipPath to get this same functionality.